BLOODBOUND Announce 2019 European Headlining Trek, "Tour Of The Dragon Empire"
Swedish power metal warriors BLOODBOUND have to this date toured in over 25 countries with festival appearances, tours as support to SABATON, HAMMERFALL, ALESTORM and U.D.O. leading up to the successful BLOODBOUND headline tours 2017-2018 in support of War of Dragons. 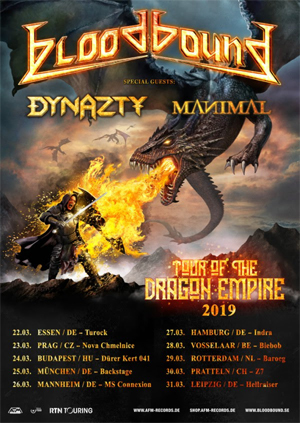 The band will now release their eighth studio album Rise of the Dragon Empire on March 22, 2019 and it will be accompanied by a European tour to present the new monstrous album. BLOODBOUND are pleased to announce the first touring leg for 2019 today! See the full tour schedule below! BLOODBOUND will bring fellow Swedes and AFM Records label mates DYNAZTY - frontman Nils Molin also known for the main melodic vocals of AMARANTHE - and MANIMAL with them on the "Tour of the Dragon Empire". DYNAZTY released its 6th studio album last September titled Firesign while MANIMAL also came up with a new record - Purgatorio - on the 7th of September. BLOODBOUND keyboard player Fredrik Bergh states "We have just finished our new album and feel we have made a monster of an album this time. We cannot wait to present this album on the road for our awesome fans! The tour package this time is simply spectacular as well and should not be missed! DYNAZTY and MANIMAL are two killer bands and it's a real honor for us to have them onboard this tour!" More details about BLOODBOUND's new album Rise of the Dragon Empire will be revealed soon!